Also called "box and whisker plots". 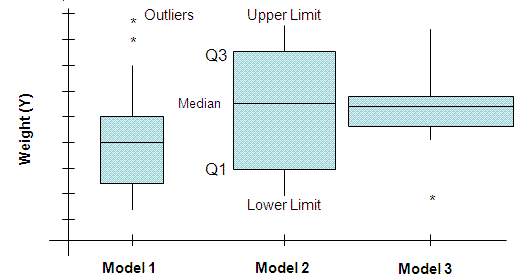 Box Plots are used as graphical summaries depicting distributions. A histogram is more informative. By viewing the plots from the side it is possible to visualize the histogram’s general shape. Two variants from the commonly used fixed width box plot are the notched box plot and the other is the variable width box plot. A sample result of a variable width box plot is shown below. 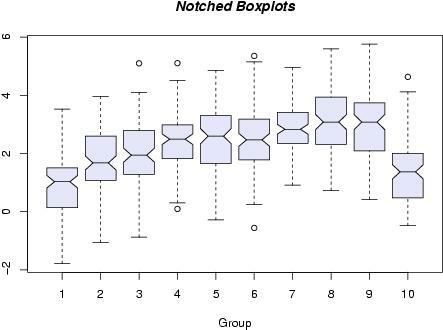 The box plot shapes and spreads can provide quick general information on variation within and between categories. It may also indicate special cause or obvious areas of opportunity (outliers). The median (M or Q2) is shown as the center point (line) in the boxes. The median is the middle value of the data where half of the points are above and half are below this value. The first quartile (Q1) represents the point where 25% of the data are below it. It is represented by the line at the bottom of the box. The third quartile (Q3) represents the point where 75% of the data are below it. It is represented by the line at the top of the box. The whisker extend up to the highest value of upper limit and down to the lowest value of the lower limit. The lowest point of the lower whisker is called the lower limit. Lower limit value equals Q1 – 1.5 * (Q3-Q1). The highest point of the upper whisker is the called the upper limit. The upper limit value equals Q3 + 1.5 * (Q3-Q1). Outliers are points that fall outside the limits of the whiskers. These are normally recognized as asterisks and are points that are greater than 1.5x the interquartile distance from each quartile. Each point that qualifies will have an asterisk. The interquartile is represented by the distance between Q1 and Q3. The widths of the box plot indicate the size of the samples. The wider the box, the larger the sample. This is usually an option in statistical software programs, not all Box Plots have the widths proportional to the sample size. The picture below is another variant of the Box-Plot from the (c)R Foundation found at http://www.r-project.org. 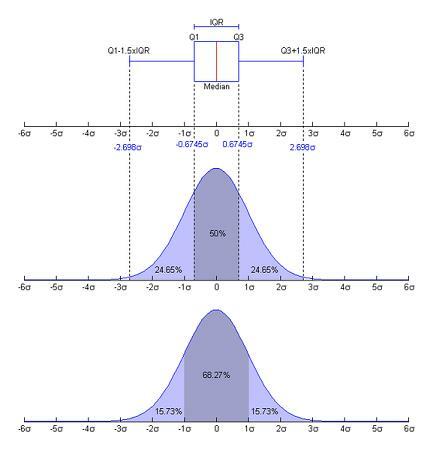 The R foundation provides free statistical software available as Free Software under the terms of the Free Software Foundation's GNU General Public License in source code form. Notched box plots contain a narrowing of the box around the median. The line where the notches converge is still the median. Notches visually illustrate an estimate on whether there is a significant difference of medians. The width of the notches is proportional to the interquartile range of the sample. It is still difficult to conclude there is or is not a difference between the medians in data set 6 and 7 but is it pretty clear that the median of groups 1 & 10 are different than 2-9. The other common variant that shows more information than the standard fixed width box plot is called the variable width box plot (like the plot at the top of this page). However, this is only valuable if comparing more than one box plot since the width is irrelevant is just displaying one box plot. One common convention is to make the width of the boxes for group of data proportional to the square roots of the number of observations in a given sample.